As part of our continued investment programme in skills, equipment and facilities we have this year expanded our CAD modelling capabilities adding a third Solidworks seat to increase the capacity of our design engineering team. 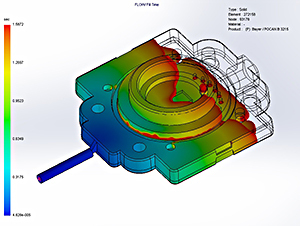 The additional seat of Solidworks has Plastics mould flow simulation, allowing us to go further in validating our designs before going to manufacture. We have made this investment as a result of high demand from our customers for advice in the development of their new products. The software means that we can reduce design lead times and, as our tooling becomes ever more complex, we are able to brief toolmakers more accurately, to minimise tooling adjustments. Solidworks Plastics sits alongside our existing CAD, 3d print and 3d scanning capabilities and extends our ability to take new products the whole way from design to production. Follow this link for more details of our Capabilities. If you have a draft model for a new project why not send it to us for review and advice? Receive Inoplas news direct to your mailbox.